"Miss Pearl" is AOA's advice columnist. She offers advice here now and then. Got a question for Miss Pearl? Send it along to MissPearl |at| alloveralbany |dot| com. We have this one couple that never shovels their sidewalk. In the handful of years we have lived there, I think I have seen them shovel the sidewalk maybe once. The snow just piles up and gets trampled down. By the end of the winter it looks like a glacier or ice skating rink or something. It is so bad that a lot of people just end up walking in the street around their stretch of sidewalk. These people seem nice enough. They give us the friendly nod or wave now and then, so I do not think they are completely oblivious to world around them. And they seem able bodied enough. And I am guessing if for some reason they can't physically shovel, they could probably afford hire to someone. So I don't know. All the neighbors will be outside shoveling sidewalks and driveways after a storm, even our elderly neighbor who is out there all the time clearing the snow herself, and nothing from these people. I could say something to them, but I feel like it should be kind of obvious that they should be shoveling the sidewalk. And I have thought about reporting them to the city, but that seems extreme. What do you think we should do about the situation? This is a safety hazard. The exact reason why they're not shoveling doesn't matter, because the situation can't continue. You could knock on their door and say something. Instead of conveying an accusatory tone, stick to concrete examples, like: "Last week I saw someone almost slip" or "I saw someone walk on the street to avoid your sidewalk and almost get hit by a car." You could also recommend someone who can shovel the snow for them, maybe even hand over a couple of business cards. Focus on the solution and the facts more than their apparent carelessness or laziness. This is an unfortunate situation -- both that your neighbors aren't tending to a basic neighborhood responsibility, and that you feel odd about talking with them about it. Relationships with neighbors can be a rare combination of anonymity and intimacy. My surrounding neighbors probably notice all the mundane details of my life: at what hours I come and go, my tendency to drift off while sunbathing on summer weekend afternoons on the patio with a pitcher of sangria and a stack of novels and fashion magazines only to be woken up by one neighbor's Great Dane or another neighbor's cat who has wandered over, the 3-4 times a year when I pack our cul-de-sac with cars owned by people unsure of where to park. Neighbors generally witness our lives from a wide angle viewpoint. But without knowing any of the specifics, and without interacting regularly, it can be awkward to talk about things when there is a problem. When I was child growing up in suburbs of the Midwest, I knew everyone who lived in every house in the three surrounding neighborhoods. We saw everyone at church, school, block parties and volunteering at local elections, charities, and sporting events. When I lived in NYC as an antisocial twenty-something, routine and geographical closeness often created situations of unwanted awareness, such as my amusing 75-year-old neighbor who seemed to keep track a little too closely of the schedule of my gentleman callers. Eventually, I moved to Albany and found myself surrounded by hardworking professionals, some with kids, some slightly older, who seem to prefer the privacy and autonomy a respectful distance affords. A few years back, I watched all of Melrose Place on Netflix over the course of a year. While I was watching the crazy characters on that show all constantly sticking their noses in each other's affairs, hanging out by the pool in the center of their condos, I'd stare out at my own backyard. That show's not great, but it made me realize I missed the role neighbors played in my life as a child. I started to seek out friends who lived near us. The easy, casual benefits of this I imagined: hosting margaritas and chips on the patio on a moment's notice, walking home from dinner parties in the brisk fall air (our heads filled with great conversation, our stomachs filled with red wine and hearty fare). It seems such an antiquated notion now though, and it never seems to work out the way I imagine it. Maybe retro block parties aren't so crazy to miss. Maybe a Melrose Place-style pool would be amazing. Maybe if we actually knew each other, it'd be easier to figure out what's happening in cases such as this. Perhaps, if we ever spoke at any other time, it wouldn't be so awkward for my neighbors to tell me my friends have parked in their driveway by mistake. My particular neighborhood is probably empty more than half the day between demanding careers and long commutes. We spend days in cubicles and evenings in front of screens. Maybe retro block parties aren't so crazy to miss. Maybe a Melrose Place-style pool would be amazing. Maybe if we actually knew each other, it'd be easier to figure out what's happening in cases such as this. Perhaps, if we ever spoke at any other time, it wouldn't be so awkward for my neighbors to tell me my friends have parked in their driveway by mistake. So, yes, do everything you can to try to solve this obvious safety hazard. But, beyond this specific situation, I wonder if all of us modern, urban folk can do more to familiarize ourselves with the people who live out their lives in close proximity to our own. Let's learn everyone's names. Let's get to know each other. Let's create an environment where people want to make their stretch of sidewalk as safe as possible for everyone. Miss Pearl is Ms. Emily Lemieux. She makes a living taking care of artwork and often imagines her friends as a Real Housewives franchise. Got a question for Miss Pearl? Send it along to MissPearl |at| alloveralbany |dot| com. + Who you calling honey, sugar? > report them to your city. Just don't do that, it's not worth it. They are your neighbors, and as the OP said, "These people seem nice enough.". Is it really worth the bad blood you would create by calling the city on them? Take turn to shovel their sidewalk from time to time, that's all -- you guys all share the same street. They are bound to notice. It's a nice thing to do for your neighbors now and then *anyway*. I am surprised that this isn't a law in this region. I have lived in other cities where not shoveling the walk resulted in a fine or citation. However, regarding your statement to "focus on the solution and the facts more than their [wrongdoing]" is good advice in any situation, and I'm going to apply that more in my life. If you have a smartphone and live in the city of Albany, there is an app for that. SeeClickFix. Easy peasey to report, plus you get to see all the other reports off areas that are of interest to you. You can use the app to report all other types of nuances as well. Parking, non functioning street lights, graffiti, etc. Well that sure was verbose. Be polite, offer them kind assistance or report them to the city. At 100 bucks a pop for each offense, the city could rake in a pretty penny, especially this winter. Imagine all of the good they could do with a bunch of extra Jackson's in their coffers. 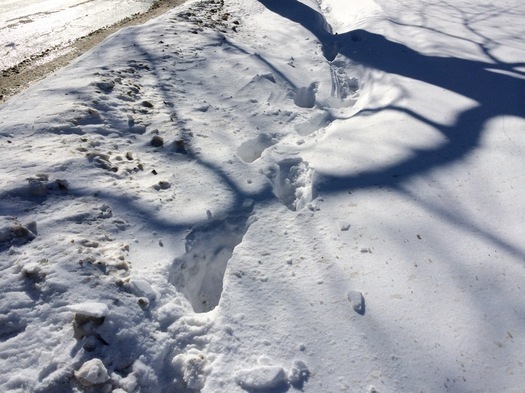 I finally reported a home owner yesterday who has not cleared his front walk all winter, thus trapping me on my nearby dead end street. I waited weeks to do so, giving him time to get to it. What burns me is that he has the ability to snow blow his driveway to get his car out, but shows no consideration for pedestrians. I will not walk in the highly trafficked street, with our without my dog. And while in an ideal world a diplomatic word with a negligent neighbor might be sufficient to resolve a problem, in my real world such interactions are usually ineffective, uncomfortable, and sometimes result in strained, hostile relations. I'll let the city of Albany play "bad cop" and fine negligent property owners for shirking their civic duty. Here's the problem with just being nice and shoveling for such people -- in many cases pedestrians have to walk routes that are not in their immediate neighborhood, to walk to work, to get to bus stops, to shop. For the most part, the property owners along that route will be strangers. I'm all for neighbors helping each other out. My next door neighbor generally snow blows my driveway when he does his. Last week an 84 yr. old neighbor shoveled my front walk early in the morning before I even got out there because he said he needed the exercise! And I'll do neighborly things for these folks in return to thank them. There will be cookies. But anybody who walks even a quarter of a mile away from their house is likely to not have such reciprocal relations with the property owners. And speaking of snow, home owners are responsible for clearing the snow from water hydrants on their property, making them accessible. I've been aware that the hydrant on my street is now behind a high bank of packed snow. I called the fire dept. about it and they are sending over someone to clear the path to the hydrant. At this point I'm not capable of digging it out myself. I have no idea if they will charge or fine the property owner, but as with the sidewalks, it's a matter of community safety. Better yet, hand them over a copy of your lawyer's business card so they know who is calling if you slip and get injured on their sidewalk. Not to be a downer but just because someone appears "able bodied" doesn't mean that's the case. Plenty of people appear perfectly healthy but are medically unable to do so (for example, those on chemo have extreme cold sensitivity). If it's a matter of community safety, take the initiative to go help them out. They'll either take the hint or maybe they'll thank you for helping them with a task they're unable to complete. If it's a homeowner I tend to give them a wider berth, even just do it myself, they're my neighbor. If it's a renter, I've tried to be nice about it, but then there's turnover and that goodwill expires. So for commercial properties, I'm more likely to use the See Click Fix site. Landlords should be taking care of trash and shoveling unless it's specified in the lease -and if it is, and the landlord gets a fine, let them harass the tenant. I'm interested in the number to call in Schenectady. Over the years, I have called so many numbers, been transferred so many times, and have never had anything done about a particular neighbor who has no problem clearing out her parking lot, but has never cleared her corner sidewalk on a busy street. Any ideas? Not shoveling your sidewalk is inconsiderate and just plain laziness. I am 29 years old and have trouble navigating some of the iced-over sidewalks in Albany(Delaware Ave & Madison for starters), I can't imagine how the elderly or a mother pushing a baby carriage manage. Use the SeeClickFixIt website to report property owners: http://en.seeclickfix.com/albany_2 People need to be held accountable!! In situations like this I like to use a simple motto: "Don't make your problem my problem." If all of a sudden I can't walk my dog, walk to work, go for a run, etc - you've made it my problem and I'm going to take the path of least resistance to ensure that it's no longer my problem. Don't like the $100 fine? Pay a kid on the block $20 to be johnny-on-the-spot with his shovel next time. I rent 1 of 2 apartments in my building and have for a few years now. There's nothing in the lease that suggests I should be responsible for snow, but my landlord never does - he lets out a huff anytime I need anything because he moved out of the city and it's a long round trip. He's a pleasant fellow but he's happy collecting rent every month from a decent tenant and worrying about other stuff. Since I'm not an oblivious idiot, and I don't like trudging up to my building, I do shovel a fair amount. But it's not always right away, especially if it's not a really big snowfall. It's always at least walkable. But at the same time, I'm not retired and it's not my responsibility to do it. So what irks me is when a neighbor pauses shoveling as I bust out the door for work in the morning and "ignore" a snowy walk. Spare me the "good morning" look. Additionally, the other tenant(s) for as long as I've been here, I can count on one hand how many times they have shoveled. I wonder if they know it's me doing it, or figure it's the landlord or someone they hired. Maybe it's like the college days, being "the least messy" roommate, refusing to empty the trash, because, sooner or later the others should figure out that it needs to be done. Only to find it piling ever-higher. The last bit that bothers me is that on the small city sidewalks there isn't a lot of room to put the copious amounts of snow we've collected. In front of my building is a "tree lawn" (thanks Google) where neighbors on each side deposit their snow. One actually clears the entire sidewalk to the curb. It all piles up on this small patch, and eventually it just tumbles off onto my sidewalk, and there's nowhere to put it, really. This is a rather unique example of an exception(?) to this valid complaint. There are plenty of lazy people ignoring it, but until everyone can an accountable member of society it might be best to go the route of reporting - it will eventually trickle down to whoever is ultimately responsible. I began writing "Shovel" in the snow. I wanted to write, "Thanks for Being a Wanker." But it was too long. Jeff D - report your landlord. Then offer to do the shoveling for a break on your rent. On my block in Saratoga, we all watch out for each other. I'll shovel a few feet of the neighbors' sidewalk if I get there first and they'll do the same for me. When somebody gets a snowblower out, they'll generally hit all the unplowed surface up and down the street. On the other hand, catty corner on the next block, NOBODY (well, hardly anybody) clears the snow. Others don't do it so why should I since the sidewalk is unusable anyway? is I guess the attitude. Hope you're satisfied now, Cyril. In a city that's supposed to be somewhat pedestrian friendly, it would be nice if this code was actually enforced. We all know who the chronic offenders are in our neighborhoods. On my old block it was at least one absentee landlord. @Susan -- the city does not have a sidewalk inspector who is going to enforce the law without residents actually reporting it. If after reporting it, nothing is done, then you have a beef you should bring directly to the mayor. You can also anonymously report non-shovelers on albanyny.org (click "Quality of Life Issues") or on your phone with ClickFix. Update on my call to the city complaining about an unshoveled walk: 6 days later nothing has been done. I called Dept. of General Services and was told it's "on the list" but the list of complaints is long and there are only 3 or 4 workers handling sidewalk snow removal. Okay, I get that they are short staffed like all municipalities. But I sure hope these property owners are charged for the work time of the DGS workers and fined for the administrative hassles. Maybe a hefty fine will be an eye opener to their legal responsibility to clear their sidewalks.